What would happen if you ran out of bread flour but still wanted to make bread? Or the store had an awesome sale on cake flour which you were tempted to use instead? Flour is basically just flour, after all, no? There’s not much difference between Pastry and All Purpose, besides a bit more protein, right? As an experiment, the class did a test this week to see what each of four types of flour could make, using the same recipe for each and changing only the type of flour used. The recipe was put together by team of Chelsea, Connor and Lauren. Each batch were made with the exact same ingredients except for the flour, in the same quantities and mixed in four identical 10-quart mixers. 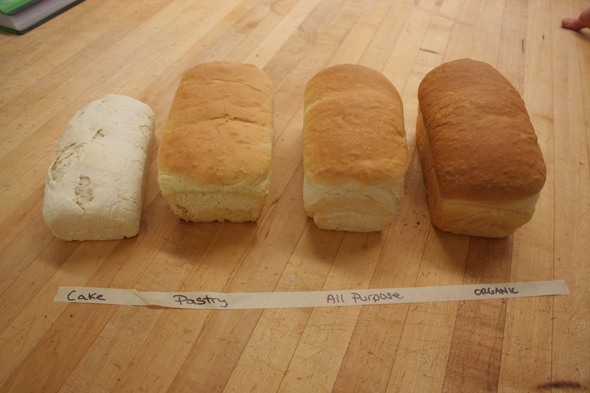 Each mix made four identically sized loaves and baked for the same amount of time. Although not under strict laboratory controlled conditions, these were, in effect, identical breads. One difference was allowed: the higher protein flours, Bread and All Purpose, were given a little more mixing time. This is because their higher gluten content needed more kneading in order to be developed properly. The lower gluten flours developed their lesser gluten amount faster. 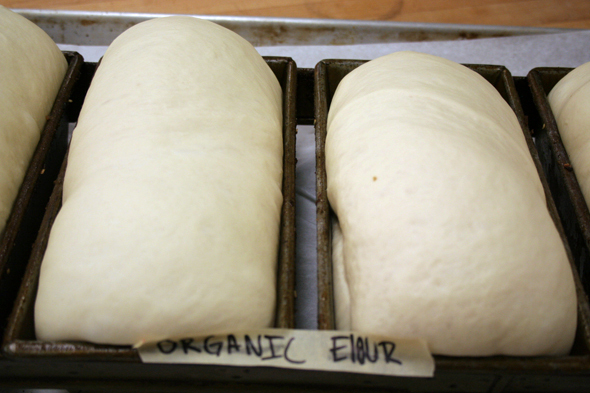 Once mixed and bulk proofed, the doughs were divided into four loaves and panned then given a final proof. The cake flour didn’t fare very well even in these early stages. As you can see in the photo, the structure of the dough is terrible. Cake flour is an extremely finely ground “soft flour” as it has such a low protein (gluten) level, about 6 to 8%. Having very little gluten development, it was unable to form a mesh of stretchy ‘fibers’ to trap any of the gasses given off by the yeast. What gluten structure there was simply tore. In a cake, this is a valuable aspect since cake batter traps only tiny bubbles of gas from (usually) baking powder. Low gluten means a softer, more tender finished cake. But in bread, these are not desirable traits. Further, the cake flour is very white, being well bleached, a very unappetizing looking dough, even before baking. Note that this cake flour is not “self-rising” – it has no chemical leaveners in it. Next we have the Pastry flour dough, clocking in at around 9% protein. This has a small amount more protein than the cake flour but still not a lot. It was able to form enough structure to not tear across the surface but you’ll note it is extremely shiny which indicates that what gluten development has occurred has gone past it’s maximum mixing. At this point, the gluten is no longer able to hold the water in the dough which gives it that wet, shiny look. You can see this wet, shiny surface in stronger doughs too, if they are allowed to be overmixed, again breaking down the gluten which can no longer trap the water. Here we have the All Purpose dough – in Canada, that is generally in the 11.5% protein levels. This dough shows a much better surface due to its higher gluten development. It was able to trap the yeast’s gas and has clearly expanded considerably more than the two previous doughs were able to do. Although this dough seems to be doing well here, it is not the best choice for making bread as that 11-12% protein is not optimal for the structure of the bread. Generally speaking, “all purpose” flour is not used in bakeries since it’s neither best for bread or pastries, falling somewhere in the middle of the two. A bakery needing “All Purpose” could well blend 50/50 Pastry and Bread flours and have a decent approximation of All Purpose, without having to stock it. Lastly, we look at the Organic Bread flour dough at about 13% protein and can see readily that it has risen even better than the All Purpose flour dough. Its gluten development is stronger and was able to stretch and still contain the gasses. The surface is markedly better than the Pastry and Cake doughs although not notably different from the All Purpose – the improvements between these two will occur more during the baking stage. One aspect that is evident here, however, is that the dough colour is noticeably more golden than the All Purpose, which has a whiter tone. 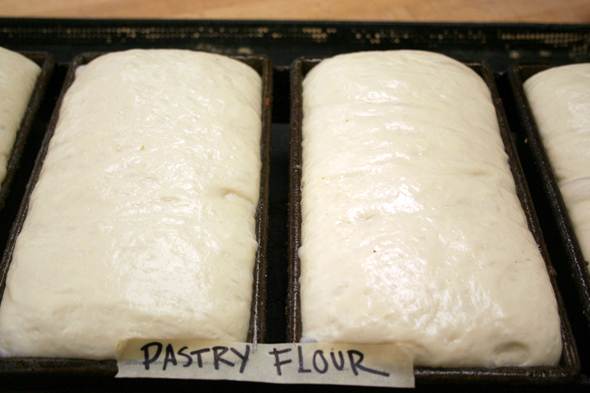 Next: the doughs go into the oven for a bake. These breads were all baked in the same oven at 180°C until the internal temperature reached around 93°C. Needless to say, the Cake flour loaf is a total failure. Not only did it not rise, it failed to even brown in spite of being in the same oven as the other loaves. Why? There is a lack of natural sugars in the dough and sugar is what caramelizes to give the golden crusts seen in the other loaves. The Pastry loaf looks slightly better but was still unable to increase in size enough during baking as it’s gluten had pretty much maxed out during mixing. The All Purpose faired a bit better although not as well as the organic bread. It shows it’s bleached aspect in the lighter crust although the fermentation process was able to convert the starch in the flour to sugars and allow a somewhat reasonable amount of browning. The Organic Bread had no bleaching to hinder it’s colour and supplied plenty of sugar for browning. The gluten structure shows excellent expandability. Slicing the breads, we look at the crumb. 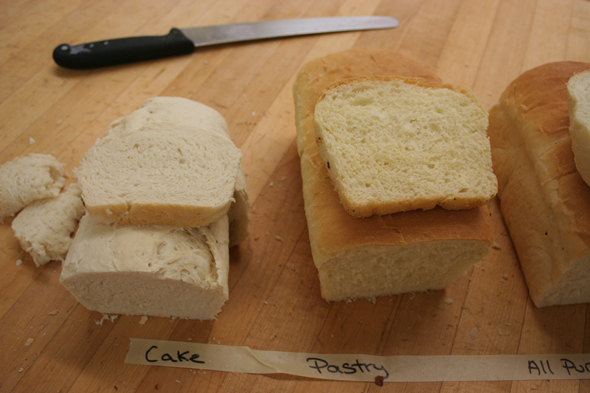 Obviously, the Cake flour bread is cakey in texture. There’s no discernible expansion, it is dense and heavy, having held much of the water. The colour is also rather unappetizing and the slices break apart easily. All the things that make poor bread would make a good cake however, using the right recipe. And the bread had an unpleasant scent, as well. The Pastry flour bread is a slight improvement on the previous one. The colour of the crumb is much better although the texture is still somewhat tight. The loaf has no spring and when pressed doesn’t come back much. Both of these loaves are clearly lacking gluten and are not meant for bread making. They are, on the other hand, superior at what they are meant for: delicate cakes and pastry where bread flour would fail just as badly at those tasks. Next, we look at the All Purpose bread. The crumb here is very white due to the flour being bleached. The development of the dough is an improvement from the previous loaves although the texture is still on the tight side. OK but we can easily do better. 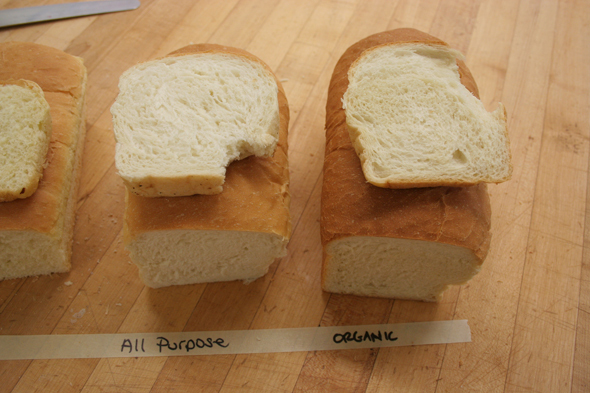 The Organic bread crumb is, for a sandwich loaf, lightest of all and the loaf does bounce back when pressed. This means the gluten is well developed and the starches have set nicely. The creamy colour of the crumb indicates the flour is unbleached and will have a better taste. This slice of bread will toast better than the other breads, imparting more flavour. And you get more bread volume for the same weight of flour. 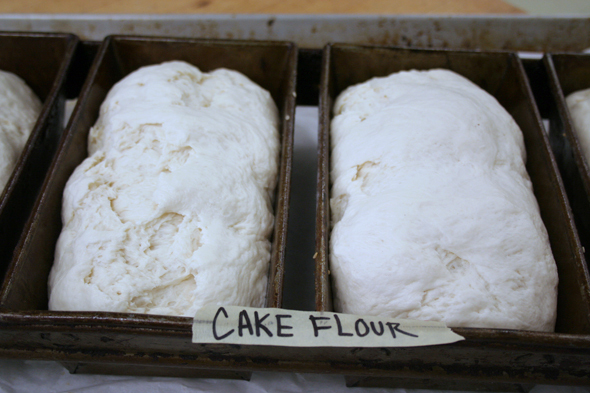 Although none of the above results are really surprising – few people would expect cake flour to make good bread – it’s good to see what happens and really know what the results are. This also visually demonstrates the benefits of higher gluten in making a good loaf of bread, even an enriched sliced sandwich loaf like these. Fascinating!! Love all of the comparison photos. I’m in the minority here…I don’t like high gluten flour to make bread and as my skill at baking has increased I have chosen low gluten flours. I think high gluten flours are a bakery’s best friend or rather a mixer’s best friend as it tolerates a lot of mixing and ignoring it, more so than a low protein flour but there’s a mouth-feel to the crumb which isn’t to my liking in high protein flours…too much of a chewiness but not in a nice way..and produces a horrible crumb if like me you like crust. If you take the tradition of French bread being a good measuring stick of good bread (this is the old methods of French bread not the horrible stuff now sold in a lot of France) their tradition is low protein flour relative to the bread flours now used a lot. The baguette flour T55 are around 11% protein, the most important thing in baguette is having great crust. For me high protein flours are great for beginners, great for doughs which are rich with fat & milk, good for bagels, and if you love your mixer. I appreciate the test results. I was looking in my cabinet last night wondering how it would work to use cake or pastry flour. Now I know. Stick with the good gluten flours. Thanks for the test kitchen results. You just made my life easier and I don’t have to waste my time and money on these ineffective methods. I have one 5lb bag of all purpose flour & six 5lb bags of bread flour. I was thinking of mixing them together to make bread in a bread machine. Should I mix them or not? If you want to make bread, you should use the bread flour since this is precisely what it’s designed for. 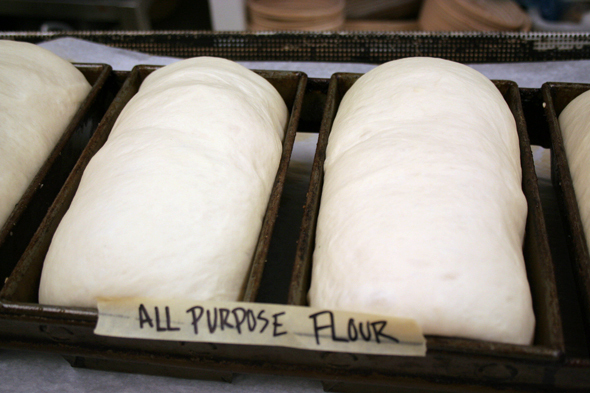 All Purpose flour has less gluten in it so it won’t be as effective at building the structure of the bread’s crumb. All purpose is in sort of a “no man’s land” area; too strong for pastry, too weak for bread. It does still have it’s purpose and you’ll see a lot of recipes that will call for it. But for bread, use bread flour. I think you can mix a combination of 80% bread and 20% all purpose flour to make a good bread. Yes, you could do that and I assume you do so yourself. I’m curious about what the final difference would be, from your own experience. Can you explain what the goal of adding 20% AP to your bread flour is? What does the resulting bread end up with that 100% bread flour would not offer? i was considering combining cake flour and all purpose to make a break. I thought it wld make it fluffy. So what makes bread fluffy? Well, this would depend on what you consider “fluffy bread”. If you are trying to make bread similar to the sliced store bought “Wonder” type stuff, they make their loaves fluffy by adding all sorts of chemicals and additives, most of which a home baker is not likely to be able to get. They also use a large amount of yeast and really whip up their batter so they can get foamy bread very quickly – it takes about 1.5 hours from start to finish to make most commercial sliced white bread. The very big downside here is that bread made this quickly does not give the dough time to be worked on by the yeast and bacteria which leads to poor digestibility and, for many people, reaction to wheat. This is different from celiac disease, which is an adverse reaction to the gluten, mind you. Simply finding it difficult to digest wheat products (most all of which are fast-produced like white sliced bread) is its own problem, although in both cases, it leads people to avoid bread or wheat based products of any sort and try to switch up to gluten-free substitutes. If you want a soft-crusted, tight-crumbed bread that’s less chemical-dependant, look for a recipe for a “Pain de Mie” which is French for bread that is all about the inside (“mie”). You’ll note that these breads will add things like oil, sugar and/or egg, all of which act as emulsifiers, coating the gluten strands so they stay short and soft. This can still be produced in a slower fashion which lets the yeast and bacteria start to break down the glutenin while giving you the softer “fluffier’ type crumb 9and less crust) which you may be looking for. Cake flour has very little gluten so it in effect doesn’t help make good bread. You’d likely find it makes rather dense, heavy bread since its lack of gluten doesn’t help to make the structure of tiny little balloons of air which help make a soft but tight crumb. What should baker do if there is dough developing problem from low grade flours or cake flour with limited options. These levels are general and the actual quality of the flour even within these levels can vary somewhat depending on the mill that produces the flours, the type and quality of wheat they can get and other factors. What do you do if you don’t have access to good flour? Go to your local bakery and talk to the baker there and see what kind of flour he has access to. He/she is probably not getting his flour form the local shop but he may be able to point you to a supplier that will offer the type of flour you need for bread. You may even be able to get him to sell you some of his flour or perhaps he can order you a bag when he next puts in his own order. It will likely be a big bag (20 kg) but you’ll be set for quite a while with that. Just be sure to store it well in tightly closed containers, keeping a small supply aside for your regular use. I have started cooking gluten free. But have lots of pastry flour. So I would like to make good rolls for company. Could I put xanthan gum in the pastry flour?? I’m afraid I can’t help you with that one, I don’t know much at all about gluten-free stuff and what all the alternative methods of making that type of baked goods entails. I’m decidedly a gluten-full type of baker. I’d expect, however, that you could probably get that and other gluten alternative questions answered on a blog that is about baking gluten-free foods. The only gluten-free things I have ever baked are gluten free by chance only, such as french macarons, macaroons and the like. As for rolls made from pastry flour, that’s probably going to be a pretty difficult trick to perform. Pastry flour, as you likely know (ergo asking about xanthan gum), is quite low on gluten so although that’s great for pastries that one expects to be soft, it’s the antithesis of what a good dinner roll needs. The gluten is what forms the web structure in the crumb that traps and stretches around the gas given off by the yeast. This gives you dough lift and expansion and, once they reach the right temp during baking, these cell walls solidify giving the bread structure. I’m really unclear how xanthan gum would / could replicate that well. Since you state that these buns would be for friends – you’re not consuming them yourself – you may want to look into getting gluten flour, sometimes known as vital wheat gluten. Adding this to your pastry flour will help increase it’s lifting properties so it at least starts to lean towards all purpose flour’s gluten content. I cn’t help you much on quantity of gluten to add to pastry flour to have it jump up to bread flour levels but that is probably out there on the intarwebs somewhere. Keep searching, your answer is likely out there. Hi, I live in Portugal and I can’t find any flour higher than 10%, I use all-purpose t55 (10%) and I generally get rather good results with it. They do, however, sell a variety of bread mixes in grocery stores that cost 4-5x more, you’d think they’re very high on protein but it says 5-7% in the nutrition facts table. They yield really good bread though, I don’t get it. I make this really soft, fluffy Hokkaido milk bread of sorts that I invented but it’s very difficult to slice and leaves a lot of crumbs when I cut it, why is this? Sorry about the tardiness, work has sort of exploded, being the Holiday season. I’ve been up to my ears in Stollen, Panettone and endless laminated goodies. Not complaining at all, mind you, but it has taken over my life somewhat. Thanks for the comment. Unfortunately, I really don’t know much at all about European flours, other than they’re rather different from the ones we have here in Canada, which are somewhat different from the ones in the USA. Plus for the last year or so I’ve been using organic, local grown, local milled flour so I’m not even using commercial flours much at all. If I might, I’d recommend finding and contacting a breadhead blogger that lives in the EU who would have MUCH more knowledge of how the different flours work in your area.Although they’re all “flour” there’s clearly enough differences between the that you can get numerous specific types – all the T types available to you are actually much more diverse than we can get here. By comparison, we have just a handful: Bread, AP, Whole Wheat (which is just AP with bran added back) Rye, Cake and Pastry. Slowly we’re seeing a few other types coming up but they’re really “specialty” flours and aren’t available widely: Spelt, Red Fife and Kamut, for example. These are all ancient or heritage grains and cost a fair bit more than even the organic bread flours. All this is to point out that my experience with flours is really quite a ways away from what you’d be getting and using as a regular home consumer. Now as for your Hokkaido loaf being crumbly… again, this is outside of my knowledge range, I’ve never made anything of the sort myself. And without the formula you used, it’s really not possible to even give a fair assessment of how the bread dough is expected to react. But this too, would probably have a fair bit to do with that European flour you have available, so I’m afraid I’d also recommend tossing this to someone closer to home who is familiar with both the flours and how they react with additional items like eggs and milk. When you do approach them, be sure to include your formula so they know how you’re making the dough and what percentages each ingredent is, etc.. That will go a LONG way to helping diagnose the crumb issue. hello, when i was boy, my father knew a italian bread baker, the bread he made at the store was so good, the inside was white as could be but also so soft, like eating cotton candy but the out side was hard and firm you could snap the end off and it would split even off, i have tried to make this kind of bread but i can not get it,any ideas? Unfortunately, this description is a little too vague to be able to pinpoint a specific type of bread other than “crusty white”. However, there are steps you can take to give your loaf a slightly crispier outside crust. The simplest way to do so is to steam your loaves when they go into the oven. Depending on what sort of oven you have, this may be simply spraying the inside of the oven for a few seconds after you’ve put your loaves in and then quickly shutting the door to keep the heat and steam in. Repeat two or three times over the next few minutes. This is probably the easiest method to steam, although it’s also the least efficient since you have to open the oven repeatedly for a fair bit to spray, losing the oven’s heat in the process. Also, most home ovens, especially gas models, are not designed to trap moisture so you’d be fighting the oven’s actual design to do this. A second way is to cover your loaves with a pan of some sort. I’ve used an inexpensive, large aluminium turkey pan (the rectangle ones, not oval) flipped over the loaves to help keep the moisture in the bread from evaporating. It isn’t the the very best way to trap moisture – there will always be a loose gap where the turkey pan sits on the baking sheet – but it’s helpful, and rather inexpensive. A similar thing to do is bake in a dutch oven. The lid of these is pretty heavy and sits atop the base quite tightly. For these, you preheat the dutch oven, with lid, in your pre-heating oven for about 1/2 hour. Take the extremely hot dutch oven out of the oven with great care and good mitts. Carefully drop the dough round into the screaming hot base (good side up), slash and place the lid back on. Carefully return the dutch oven to the oven and bake covered for 20 minutes. This now much much smaller and sealed “oven” space the loaf sits in accumulates the steam from the dough easily and allows the bread to rise very well. At 20 minutes, remove the cover and bake the uncovered bread for the remainder of the expected time, usually about 20 more minutes or until a rich brown colour is reached. If you don’t already own one, a dutch oven can be a bit of an expenditure, especially if you only use it for breads. However, it also works for stews, casseroles and more so it’s not a pricey one-trick pony. Also, it is rare to find a dutch oven that isn’t round so you have to accept the fact you’ll be making boules this way. What sort of bread to bake this way? Any type of bread you think hits the mark for you as far as the crumb you’re aiming for, which you describe as “soft as cotton candy”. I am a longtime bread baker, but always love reading and learning about the process. I got started on this search because my favorite mild bread recipe calls for a half cup of cake flour along with the 3 and a half cups of bread flour and I was trying to find some rationale for that…still no clue.